Thailand is a deeply spiritual country, in which both superstition and ritual tattooing play an active role. Traditional Thai tattoos are known as Yantra tattoos. They are believed to possess strong magical powers, which will protect the bearer as well as bring him or her good luck. With their alleged ability to break knife blades and stop bullets, this form of tattooing is particularly favoured by soldiers and the police force as well as, inevitably, by members of the underworld. Thai culture is a rich mixture of many Asiatic religious traditions. It encompasses Hinduism, Brahmanism, Animism and Buddhism. 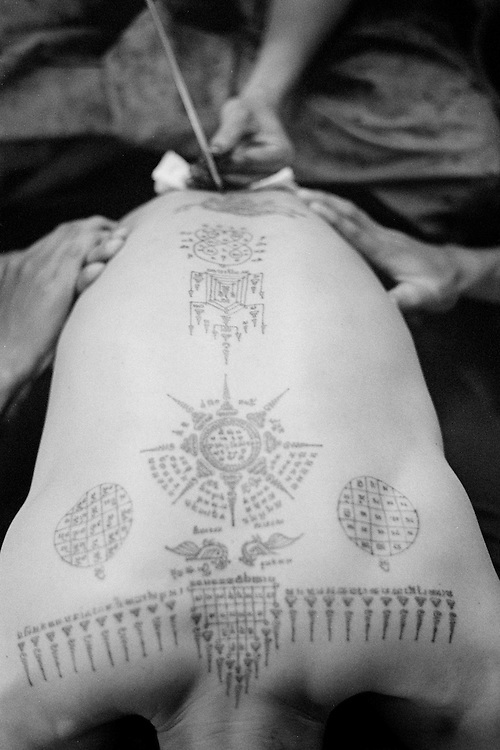 Whilst being ingrained in Hindu culture, Yantra tattoos, known also in Thailand as "Sak Yant", incorporate many elements from these other belief systems. A further influence is taken from ancient Khmer Sanskrit texts, many of which are believed to possess magical powers. Yantra or Sak Yant tattooing is a widely practised form of sacred tattooing prevalent throughout Southeast Asia. Adepts are to be found mainly in Cambodia, Laos and Thailand, although there is a growing interest in Singapore among Chinese Buddhists. Sak Yant is usually performed by a "whicha" (magic) practitioner. Today the best-known temple for Yant or Sak Yant tattooing is Wat Bang Phra. This temple has an unbroken tattooing tradition dating back to the Ankor period. The motifs and designs have evolved over the centuries, often as the result of visions received during sessions of intensive meditation.